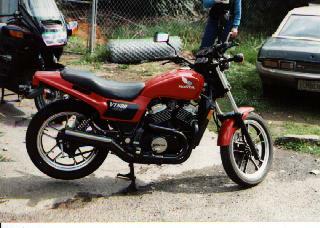 This is a 1984 (top two photos), Candy Burgeone Red in color, and at the time, only 8K on the odometer. It even has the origninal Mag Mopus Bridgestone front on it, although quite bald. However, the last few photos of red ones are a couple of excellent restorations I will add! 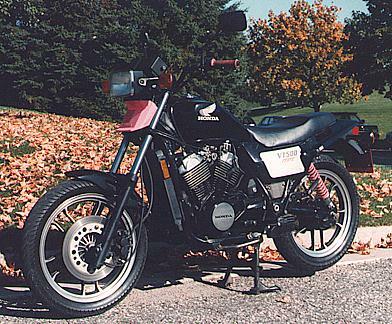 This picture of a 1984 Ascot VT500, black, and has less than 3000 miles on it!!! (thanks, David S., for the picture!) 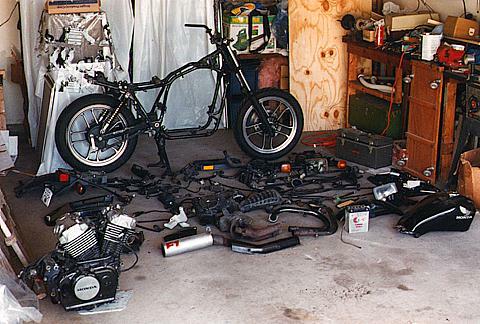 So, I guess THIS is what my bike is supposed to look like!?!?! Nice! This is another 1984, but Black in color. Black Ascots seem to be the minority. 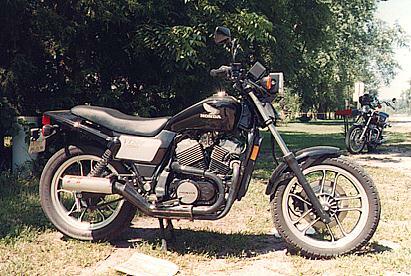 I only have seen two (mine and this one for sale) and know of a few more black ones out there. At the time, it was for sale and had about 11K on it. This was for sale about a month after I bought mine. 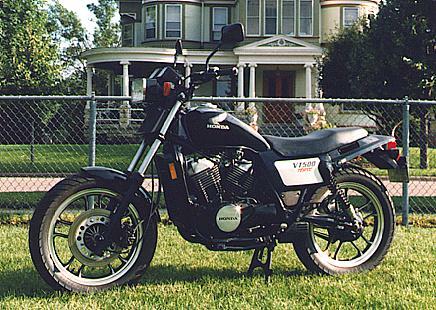 Just as well, the asking price was in 1992 was $1200 compared to the $750 I paid for mine. 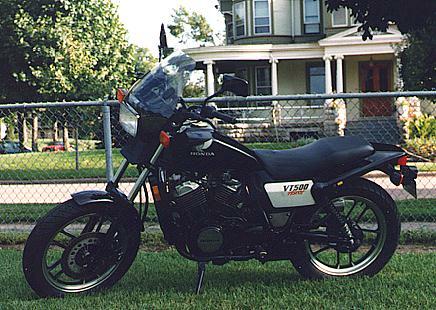 The main reason why the price on my VT was right was because it had set outside, in the sun most of it's life--not much that wasn't faded. Also, the engine needed a little work to remedy a slight slapping sound. 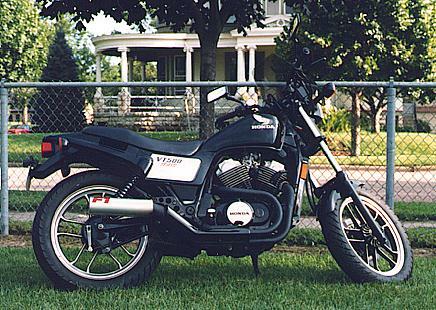 I test rode this one anyway to see if there was any difference between the bikes, since mine has the same F1 muffler on it. However, mine has a little bit more power than this one. 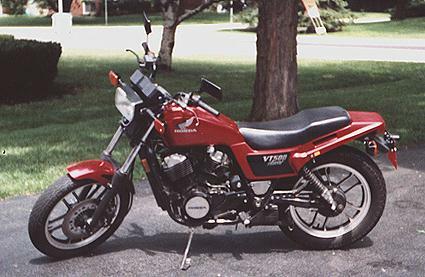 Just recently, I've discovered why my VT develops more power than any I've ridden, not to mention it's performance is better than found in tests. 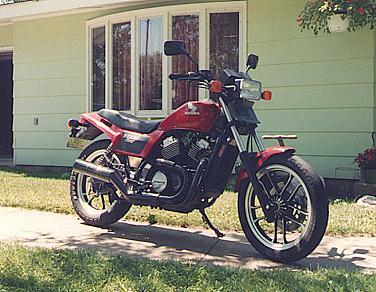 The previous owner installed larger jets, thus the richer mixture and increased power. The front carburator is supposed to have a #112 jet, but I found a #125 instead. The rear is supposed to have a #120 jet, but I found a #132 instead. After adjusting the float levels ever-so-slightly and tweaking in the syncronization, it REALLY boogies! 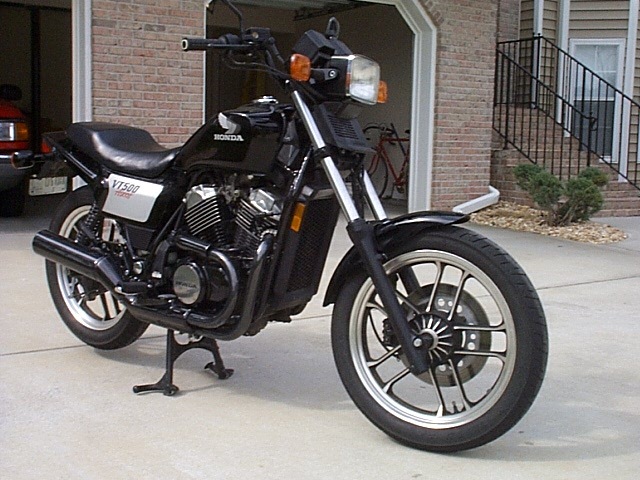 (Also, if you look in the background, you will see my '81 Kawasaki CSR 305. There is a better picture of it on "Scott's Cycle Anthology" page. I finally got pictures developed of my Ascot just after finishing every little detail on it since it's restoration in '97. This first shot, pictured above, was a 'quickie' so my friend could finish off his roll of film. It was taken in the early fall of '97. Despite the poor image quality from his camera being suited for indoor/flash use only, it still shows some of it's new character since the resto. The windshield is not permanant and I can quickly remove it via two knobbed bolts for an original look and some wind to my chest on hot days. 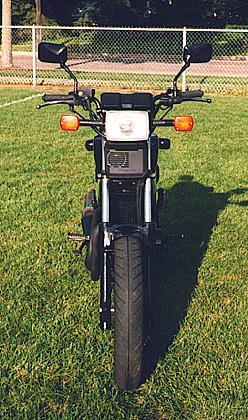 It is a National Cycle Deflector Shield LX, which is made of Lexan and tinted a light smoke. 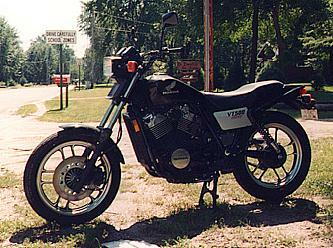 Notice how the Ascot VT is quite a narrow bike, which helps make it very nimble and quick on the road. Someday, the Ascot will get a professional repaint. At that time, the engine will be reworked. It has been a wonderful cycle for me. Honda has made a fine work of reliable art. Just now, the engine gaskets are starting to age. Did I mention that it now has 43,000 miles on it? Still runs strong as new. 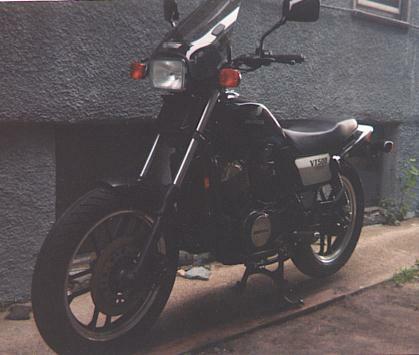 (I'll also mention that I'm sure the engine hasn't had much of an easy life--I know I've taken the engine well into the red many times--that's the kind of bike it is.) The funny thing is now it leaks oil rather than what oil it consumes. It only seems to consume small amounts of oil during an extended cruise at high speeds or a lot of performing on country roads. Oh well, no big deal to me. 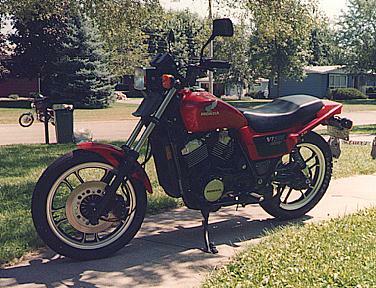 Here are the tires I mounted on my Ascot... Cheng-Shin Barracuda tires, which for some reason I can find them for sale anymore. The front is a 110/90H18 and the rear is a 120/90H18. These tires are incredibly excellent for how little they cost. I believe they ran under $150, mounted and balanced, total! 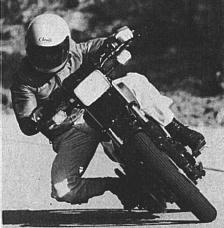 There was ONLY one time I felt the rear tire 'slip' a bit. I nailed it leaving a stop sign while turning out onto the highway. I believe I might have crossed over the painted yellow line but it was very minimal what I did notice. Otherwise, I just can't seem to break them free! I've banked the bike all the way to just 1/3 inch of the outer tread! 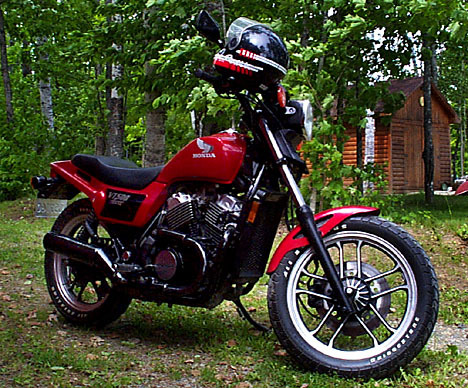 They are a perfect complement to the bike's performance ability. 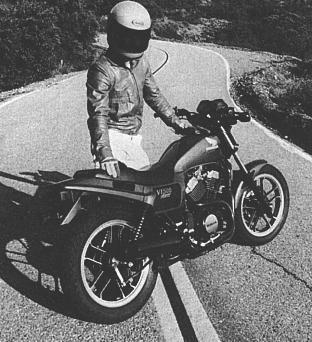 Breaking is as good as the bike's suspension can be anyway. 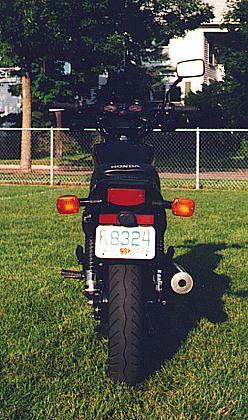 I did make the front tire 'howl' when I rode some twisties HARD with a friend on the rear end. That was a lot of force on the tires that day! But, the Barracudas kept us upright and on the road. 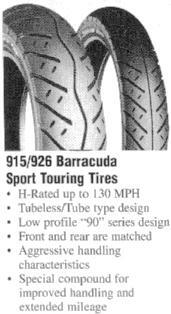 I highly recommend these tires for any Ascot VT owner or even any medium to light bike owner. Sure, the bigger name tires are just as nice, but for the price...you can't go wrong! Wooooaaahhh! --No camera trick either!!! This photo makes the cycle look smaller than it really is. 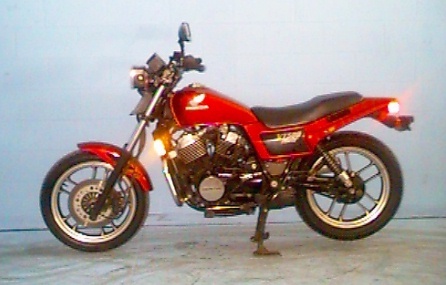 This is a Shadow 500 I bought to restore for my father to get back into motorcycle riding. Here is a "before" picture and more will follow showing progress up to the completed stage. I touch base on the Shadow on my Anthology page. Another project of mine is a pair of Chaparral snowmobiles. I'll add pictures here very soon. You've got to see how bad they were. One is a '73 Firebird 340, the other is a '74 SS/III 440 and each with barely over 1000 miles on each. 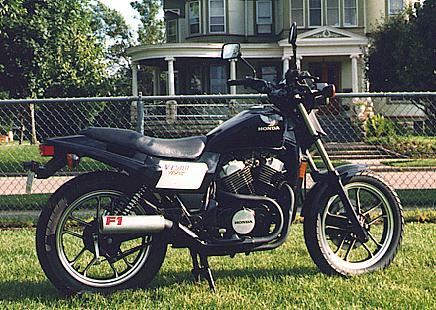 Both powered by a Fuji twin, which I'm told is a powerful engine. I recently got the 340 running (probably for the first time in 20 years). Now to clean up the chassis, fix some broken welds on both bogeys, repair the hood and get it ready for winter. I'll be selling both to make room for more cycle restorations.